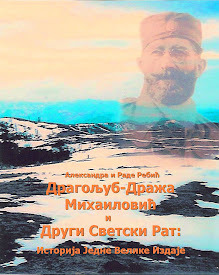 General Draža Mihailovich: HALYARD MISSION 71st anniversary celebrated in Pranjani, Serbia on September 25, 2015! HALYARD MISSION 71st anniversary celebrated in Pranjani, Serbia on September 25, 2015! 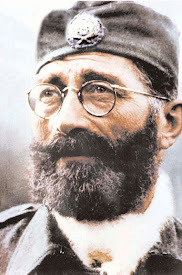 Aleksandra's Note: So pleased to see that the historic Halyard Mission Rescue Operation that took place on enemy occupied territory in WWII Yugoslavia in 1944 is being officially recognized and celebrated in Serbia! 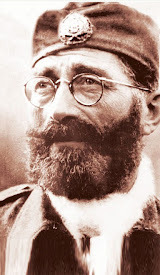 This is important, because for far too long, the rescue of over 500 American Airmen and additional Allied Airmen by the Chetnik Forces of General Draza Mihailovich was not only kept classified, it was treated as though it never happened, due to communist control of the homeland and "political" considerations here in America. Many thanks to Lt. Col. John Cappello, president of The Halyard Mission Foundation, for the text and photos describing the celebration that took place in September 2015 to commemorate the 71st anniversary of the Halyard Mission Rescue Operation. This event, which promises to be an annual commemoration, is important, too, in facilitating reconciliation between Serbs and Americans. 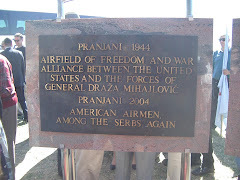 On Friday, September 25th, the 71st anniversary of the Halyard Mission was celebrated in Pranjani, Serbia, the location of the rescue of over 500 American Airmen during the Second World War. The Halyard Mission Foundation would like to thank the U.S. Embassy for sponsoring this year's event. 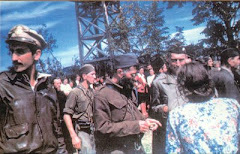 The event started with a wreath laying ceremony on Galovica Field, the site of the runway built for the rescue mission. Representatives from the United States Air Forces in Europe (USAFE), the U.S. Embassy, the Serbian Ministry of Defense, the Municipality of Gorni Milanovac, and the Halyard Mission Foundation laid wreaths at the monument on the field. Brigadier General Mark D. Camerer, the Director of Plans, Programs and Analyses for Headquarters U.S. Air Forces in Europe, made remarks following the wreath laying. Additionally, the Mayor of Gorni Milanovac, Mr. Milisav Mirković, and Dr. Oliver Antic, representing the President of Serbia's Office, both addressed the crowd at Galovica Field. Other special guests included Ms. Laura Gross, Principal Director for Political Affairs of Russia, Ukraine and Eurasian Affairs, U.S. Department of Defense; Brigadier General Dusko Žarković, Deputy Commander, Serbian Air Forces; John Cappello, Lieutenant Colonel retired and president of the Halyard Mission Foundation; Colonel Taft Blackburn, Defense Attaché, U.S. Embassy, Belgrade; and Gordon Deguit, Deputy Chief of Mission, U.S. Embassy, Belgrade. Following the wreath laying ceremony the party proceeded to Pranjani's church for a short memorial service led by the community priest, V. Rev. 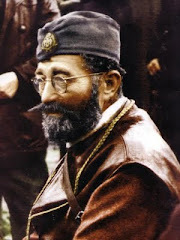 Vojislav Risimovic. 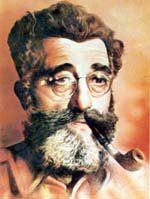 Afterward the group was treated to a screening of a documentary dedicated to the life of George Vujnovich. 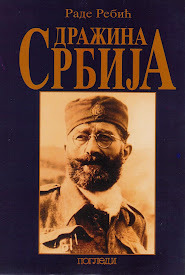 The movie was viewed at Pranjani's Ivo Andric Middle School, a fitting location for the visitors to experience the telling of an important piece of the community's history. 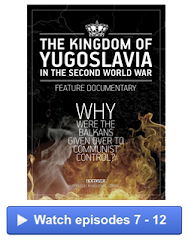 The documentary, produced by EuroAtlantic Initiative, was written by Halyard Mission Foundation members Daniel Sunter and Bojan Dragicevic and directed by Dejan Zivkovic. The forty-five minute film told the story of George Vujnovich... Vujnovich, who passed away in 2012, helped plan and execute the Halyard Mission. His story is intertwined with those of George Musulin, Nick Lalich, Arthur Jibilian, and the others that participated in the rescue of allied airmen from Serbia. 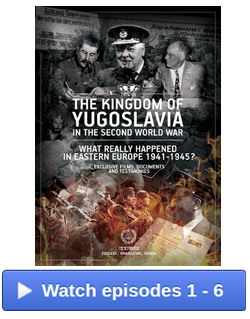 Their collective daring and heroism is told through the eyes of George Vujnovich and the stories he tells of this amazing mission. After viewing of the special documentary the group was treated to delicious lunch of traditional Serb specialties at the Jevtovich Ranch in Leusici, a short drive from Pranjani. Again, a special thanks to the Defense Attaché Office (DAO) of the U.S. Embassy in Belgrade. The event could not have happened without the support and tremendous efforts of Colonel Taft Blackburn, Senior Defense Official/Defense Attaché; Major Todd Andrewsen, Air Force Attaché; Master Sergeant Andre Shand, Operations NCO; and Ms. Mila Antonic, Administrative Assistant, Defense Attaché Office. All photos courtesy of Lt. Col. Cappello. Brigadier General Mark Camerer, Headquarters U.S. Air Forces in Europe, makes remarks following wreath laying ceremony on Galovica Field, Pranjani, Serbia. BG Mark Camerer and Ms. Laura Gross, U.S. Department of Defense, lay wreath at ceremony on Galovica Field, Pranjani, Serbia. Delegations prepare for wreath laying ceremony on Galovica Field, Pranjani, Serbia. Wreaths at Halyard Mission monument on Galovica Field, Pranjani, Serbia. U.S. Department of Defense, prior to wreath laying ceremony on Galovica Field, Pranjani, Serbia. U.S. Embassy, Serbia, standing in front of Pranjani's church. 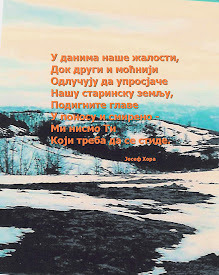 in Leusici, Serbia, short drive from Pranjani.